An 8.9-magnitude earthquake hit northern Japan early Friday, triggering tsunamis that caused widespread devastation and crippled a nuclear power plant. Are you in an affected area? Send an iReport. Read the full report on the quake, tsunami and the fears surrounding Japan's damaged nuclear reactors. [11:43 p.m. ET Sunday, 12:43 p.m. Monday in Tokyo] Six people were injured after Monday morning's explosion at the building housing the No. 3 reactor at the Fukushima Daiichi nuclear plant in northeastern Japan, Tokyo Electric Power Co. says. Seven people earlier reported as missing have been accounted for, a company official told reporters. Japanese public broadcaster NHK showed images of white smoke rising above the facility. Citing the nation's nuclear and industrial agency, NHK said that a wall of one of the reactor's buildings had collapsed. Japan's chief cabinet secretary said a day earlier that accumulating hydrogen gas "may potentially cause an explosion" in the building housing the No. 3 reactor at the Daiichi plant. A similar scenario played out Saturday, when a blast caused by hydrogen buildup blew the roof off a concrete building housing the plant's No. 1 reactor. [11:33 p.m. ET Sunday, 12:33 p.m. Monday in Tokyo] The official death toll from the earthquake and the tsunami has risen to 1,627, authorities said Monday. This doesn't count the 2,000 bodies that the Kyodo news agency reported were found Monday in Miyagi Prefecture on Japan's east coast. As of 10 a.m., at least 1,720 people were missing and 1,962 injured, according to the National Police Agency Emergency Disaster Headquarters. The number of dead is expected to go up as rescuers reach more hard-hit areas. [10:59 p.m. ET, 11:59 a.m. Tokyo] An explosion happened late Monday morning at the Fukushima Daiichi's No. 3 nuclear reactor building, Chief Cabinet Secretary Yukio Edano confirmed to reporters. The container vessel surrounding the reactor remains intact, Edano said, citing the head of the nuclear plant report. Residents remaining within 20 kilometers of the plant, despite an earlier evacuation order, have been ordered to stay indoors, according to Edano. The secretary added that initial reports suggested that radiation levels had increased after the blast, but Edano said he did not believe there was a massive leak, given that water continues to be injected into the reactors and that the pressure inside the reactor is "within a certain range." Edano said a day earlier that accumulating hydrogen gas "may potentially cause an explosion" in the building housing the No. 3 reactor at the Daiichi plant. A similar scenario played out Saturday, when a blast caused by hydrogen buildup blew the roof off a concrete building housing the plant's No. 1 reactor. [10:38 p.m. ET, 11:38 a.m. Tokyo] Approximately 2,000 bodies were found Monday in Miyagi Prefecture on Japan's east coast, the Kyodo news agency reported. [10:31 p.m. ET, 11:31 a.m. Tokyo] Japan's nuclear safety and industrial agency reported sounds of an explosion at the Fukushima Daiichi nuclear plant's No. 3 reactor, according to Japanese public broadcaster NHK. White smoke could be seen rising from the facility at 11 a.m. Monday. Workers have been flooding this reactor and the plant's No. 1 reactor with seawater to cool them after the earthquake and tsunami damaged the reactors' cooling systems. Chief Cabinet Secretary Yukio Edano said a day earlier that accumulating hydrogen gas "may potentially cause an explosion" in the building housing the No. 3 reactor at the Daiichi plant. A similar scenario played out Saturday, when a blast caused by hydrogen buildup blew the roof off a concrete building housing the plant's No. 1 reactor. The reactor and its containment system were not damaged in the explosion at the No. 1 reactor. [9:39 p.m. ET, 10:39 a.m. Tokyo] The death toll from the earthquake and tsunami has risen to 1,598, with hundreds more missing, authorities say. At least 1,720 people were missing and 1,923 injured, according to the National Police Agency Emergency Disaster Headquarters. The number of dead is expected to go up as rescuers reach more hard-hit areas. [9:29 p.m. ET, 10:29 a.m. Tokyo] An aftershock with a magnitude of 5.8 was recorded 27 minutes ago off Japan's east coast, about 140 kilometers northeast of Tokyo, the U.S. Geological Survey reports. [9:09 p.m. ET, 10:09 a.m. Tokyo] Japan's NHK television network shows the rescue of three senior citizens who had been trapped in a tsunami-swept car for 20 hours. [8:57 p.m. ET, 9:57 a.m. Tokyo] More information about the 60-year-old Japanese man who was rescued at sea Sunday after he was spotted clinging to the swept-away remains of his house: "I thought today was the last day of my life," Hiromitsu Shinkawa told his rescuers, according to Kyodo News Agency. [8:51 p.m. ET, 9:51 a.m. Tokyo] The leading Japanese stock index skidded nearly 5% in the opening minutes Monday, the first full day of trading in Tokyo following last week's earthquake. The Tokyo Stock Exchange opened as usual at 9 a.m. Japan time. The Nikkei-225 index tumbled 493 points, or 4.8%, to just above 9,700, according to the Nikkei website. It was down even further, almost 600 points, in the first few minutes before rebounding. [8:32 p.m. 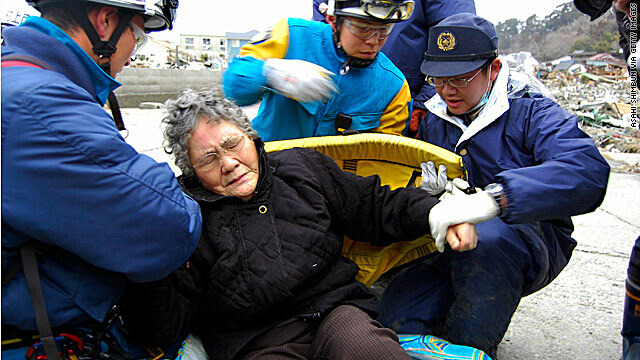 ET, 9:32 a.m. Tokyo] In the following video, a victim of the tsunami - rescued by the Japanese military - says water swept her out of her home, and that she clung to a tree and then a mat before she was helped. [7:50 p.m. ET, 8:50 a.m. Tokyo] About 2.5 million households - just over 4% of the total in Japan - were without electricity Sunday, said Ichiro Fujisaki, the nation's ambassador to the United States. Rolling blackouts are expected in some areas to preserve electricity. [6:35 p.m. ET, 7:35 a.m. Tokyo] The International Atomic Energy Agency says that - based on information the agency received from officials in Japan - investigators determined that radiation levels have returned to "normal" at one of the power plants previously flagged for concern. The agency said that authorities have concluded that there were "no emissions of radioactivity" from the three reactors at the Onagawa nuclear plant. "The current assumption of the Japanese authorities is that the increased level may have been due to a release of radioactive material from the Fukushima Daiichi nuclear power plant" located 135 kilometers (about 85 miles) north of Onagawa, the IAEA said. Japanese officials still are concerned about the Fukushima Daiichi plant, where workers are flooding two reactors with seawater to keep them cool. [5:34 p.m. ET, 6:34 a.m. Tokyo] While the full extent of the disaster's aftermath is not yet clear, the earthquake and tsunami that devastated parts of Japan could be the most expensive quake in history, CNNMoney reports. Losses from the quake, tsunami and fires will total at least $100 billion, including $20 billion in damage to residences and $40 billion in damage to infrastructure such as roads, rail and port facilities, catastrophe modeling firm Eqecat estimated. [4:56 p.m. ET, 5:56 a.m. Tokyo] Japanese officials said Sunday they will backstop the country's financial system when markets reopen after Friday's devastating earthquake and tsunami, CNNMoney's Chris Isidore reports. The Bank of Japan, in a statement, said it would monitor financial markets and the operation of banks and "stand ready to respond and act as necessary." The aim is to make sure the banks have enough cash on hand to meet demands of panicky investors and cover withdrawal demands of bank customers. Friday afternoon's earthquake hit just before the close of trading in Japanese markets. The benchmark Nikkei 225 stock index dropped just over 100 points, or 1%, in the final minutes of trading and ended the day 1.7% lower. [3:58 p.m. ET, 4:58 a.m. Tokyo] Japan's Kyodo News Agency has reported a dramatic rescue took place off Japan's coast Sunday, when a Japanese destroyer rescued a 60-year-old man at sea, some 15 kilometers (9 miles) off Fukushima prefecture. [3:13 p.m. ET, 4:13 a.m. Tokyo] Japanese media report 42 people were rescued Sunday in Minami Sanriku, a northeastern Japanese town where an estimated 9,500 people - more than half the town's 18,000 population - are unaccounted for. [2:16 p.m. ET, 3:16 a.m. Tokyo] Delta Airlines resumed its full flight schedule to Japan on Sunday. [1:54 p.m. ET, 2:54 a.m. Tokyo] Numerous U.S. rescue and assistance teams arrived Sunday in Japan and are helping lead a broad international effort to bring relief to areas ravaged by Friday's earthquake and tsunami. The United States, the United Kingdom, China, and South Korea are among 69 governments that have offered to help, Kyodo News Agency reported, citing the Japanese foreign ministry. [12:36 p.m. ET, 1:36 a.m. Tokyo] The death toll from the earthquake and tsunami that hit Japan late last week rose to 1,597, with hundreds more missing, authorities said early Monday. As of 12:01 a.m. (11:01 a.m. ET), at least 1,481 people were missing and 1,923 injured, according to the National Police Agency Emergency Disaster Headquarters. The number of dead is expected to go up as rescuers reach more hard-hit areas. [11:00 a.m. ET, 12:00 a.m. Tokyo] The death toll from the earthquake and tsunami that hit Japan on Friday rose to 1,353, with hundreds more missing, authorities said Sunday. As of 9:30 p.m. (8:30 a.m. ET), at least 1,085 people were missing and 1,743 injured, according to the National Police Agency Emergency Disaster Headquarters. [10:39 a.m. ET, 11:39 p.m. Tokyo] A state of emergency has been declared at a nuclear power plant in Onagawa, Japan, where excessive radiation levels have been recorded following Friday's massive earthquake, the United Nations' atomic watchdog agency said Sunday. Authorities have told the agency that the three reactor units at the Onagawa plant "are under control." [10:21 a.m. ET, 11:21 p.m. Tokyo] As international aid began to flow into Japan on Sunday, China's Red Cross said it would donate around $152,000 dollars in emergency aid to its Japanese counterpart, China's official Xinhua News Agency reported. [9:48 a.m. ET, 10:48 p.m. Tokyo] South Korea planned to send a 102-member rescue team to Japan on Sunday, South Korea's Yonhap news agency reported. South Korea has also arranged for shipments of liquified natural gas to be sent to Japan, the agency said. [9:10 a.m. ET, 10:10 p.m. Tokyo] Japanese Prime Minister Naoto Kan called on his country Sunday to prepare for sacrifice and to work together in overcoming the effects of the devastating earthquake and tsunami. "We Japanese had a lot of difficulties in the past, but we were able to overcome those difficulties to reach this peaceful and prosperous society we have been able to build. So with regard to the earthquake and tsunami, I am confident that the Japanese people can be united to work together. ... I ask each one of you, please have such determination, and deepen your bond with your family members, your neighbors, and the people in your community to overcome this crisis so that Japan can be a better place. We can do it together." [8:07 a.m. ET, 9:07 p.m. Tokyo] The death toll from the earthquake and tsunami that hit Japan on Friday rose to 1,217, with hundreds more missing, authorities said Sunday. As of 7:30 p.m. (6:30 a.m. ET), at least 1,086 people were missing and 1,741 injured, according to the National Police Agency Emergency Disaster Headquarters. [7:57 a.m. ET, 8:57 p.m. Tokyo] Some 12,000 people have been rescued from the ruins of Friday's massive earthquake in Japan, Prime Minister Naoto Kan said late Sunday. [7:30 a.m. ET, 8:30 p.m. Tokyo] The USS Ronald Reagan has started delivering aid in the coastal regions of Japan's Miyagi prefecture. Crew members, in conjunction with the Japan Maritime Self Defense Forces, have conducted 20 sorties delivering aid pallets using eight U.S. and Japanese helicopters, according to Sgt. Maj. Stephen Valley of U.S. Forces Japan. The Kyodo news agency reported that the team hopes to deliver 30,000 portions of emergency food rations in this initial operation. [7:08 a.m. ET, 8:08 p.m. Tokyo] Japanese Prime Minister Naoto Kan has ordered a Tokyo power company to conduct a widespread power outage in an effort to preserve energy as workers try to repair power plants damaged in Friday's devastating earthquake. [6:45 a.m. ET, 7:45 p.m. Tokyo] There is a 70% likelihood that Japan will experience an earthquake of 7.0 or above in the next three days, the country's meteorological agency said. Takashi Yokota, director the Earthquake Prediction Information Division of the agency said he based his prediction on increased tectonic activity. [5:37 a.m. ET, 6:37 p.m. Tokyo] Japan Meteorological Agency has canceled all tsunami advisories. Meanwhile, the death toll from the quake rose on Sunday to 977 dead. At least 739 people are missing and 1,683 are injured, according to the National Police Agency Emergency Disaster Headquarters. [4:47 a.m. ET, 5:47 p.m. Tokyo] A round of sirens urged people to go to higher ground in Sendai, a city affected days earlier by a tsunami. The tsunami advisories by local officials were prompted by aftershocks following an 8.9-magnitude earthquake that struck last week. [3:46 a.m. ET, 4:46 p.m. Tokyo] A second explosion could occur at an earthquake-struck nuclear plant in northeastern Japan, a government official told reporters Sunday. Chief Cabinet Secretary Yukio Edano said an explosion could occur in the buliding housing the No. 3 reactor at the Fukushima Daiichi plant. [1:55 a.m. ET, 3:55 p.m. Tokyo] According to Japan's Kyodo News, the magnitude of the devastating quake was revised upward on Sunday from 8.8 to 9.0, making it one of the largest in history, the Japan Meteorological Agency said. [12:21 a.m. ET, 2:21 p.m. Tokyo]The death toll from the earthquake and tsunami that hit Japan late last week rose to 801, with hundreds more missing, authorities said Sunday. At least 733 are missing, according to the National Police Agency Emergency Disaster Headquarters. The number of dead is expected to go up as rescuers reach more hard-hit areas. [12:21 a.m. ET, 2:21 p.m. Tokyo] Sgt. Major Stephen Valley, spokesman for U.S. Forces on Japan, tells CNN that the aircraft carrier Ronald Reagan has arrived off the waters of northern Honshu and is operational, preparing for relief efforts.